Setting out to break 30 minutes in a 5-K is a challenging yet achievable target for relatively new runners, those returning from a layoff, or longtime recreational runners. Sign up for a race five weeks out, and stick with a plan (see below). “Training consistently and doing speed workouts will help make you faster,” says running coach Pete Rea. Goal pace and tempo runs will get you comfortable with holding a speedier pace. 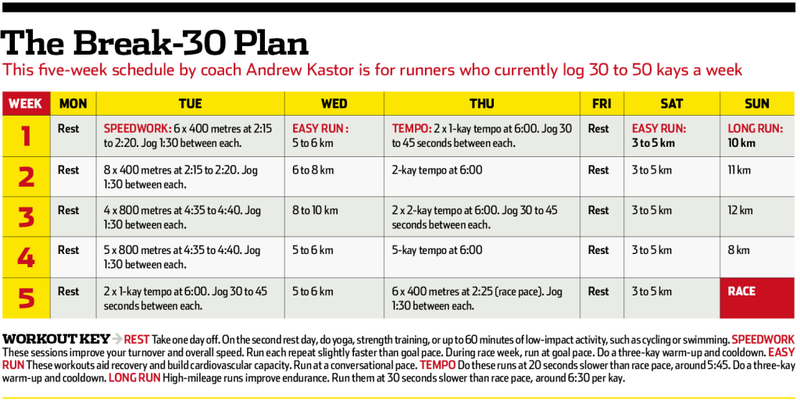 Who’s Up For It: Runners who log 8 – 10km four times a week and can comfortable complete a kilometre in about 5:35 to 5:40. Practice Fast Paces Run 4 x 1 000 metres (2.5 times around a track) at slightly faster than race pace, with a two-minute jog between repeats. “If you can nail this workout, you’ll run close to that pace for a 5-K,” says Rea. Do it two weeks into training and again 10 days before race day. Make Time To Tempo A tempo run is a comfortably hard workout, where you can speak a few words at a time. Warm up for 10 minutes, then take five minutes to work up to a 10- to 20-minute tempo at just slower than your 10-K pace, says Thomas Morgan, a university track-running coach. Add a couple of minutes each week until you’re up to 30 minutes. Keep moving Rest one full day, but spend one rest day cross-training, says Darcy Norman, a performance specialist at an athletics coaching business. Mix up cross-training days with the following – Power plyo: Do 10 to 30 seconds each of jumping jacks, high-knee marches and skips, squat jumps (from a squat, explode upwards), split squat jumps (from a lunge position, explode upwards and switch legs), and single-leg hops. Flex training: For 10 to 15 minutes, do a dynamic yoga series, such as knee hug, low lunge, downward dog, and plank. Active recovery: Up to one hour of low-impact cardio.